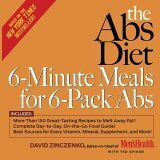 The Abs Diet is a nutritional diet created by "Men's Health Magazine", editor David Zinczenko. The Abs Diet, a revolutionary new diet and exercise plan that promises to dramatically improve your body—fast. The Abs Diet is guaranteed to give you a flat stomach and great physique in just 6 weeks—and keep you lean and healthy for the rest of your life! This never-before-published program offers the simplest, fastest, and most effective plan to strip away fat from your belly and turn fat into muscle. How? By feeding your body—not starving it. Using the most up-to-date science, you’ll discover how to melt away fat and create muscle (even if you don’t exercise! )—and dramatically improve your life in the shortest possible time. Simply put, The Abs Diet is a scientifically proven food plan that turns on your metabolic fat furnaces and puts the resulting energy to work building muscle. Within 2 weeks, you'll lose up to 12 pounds of fat—from your belly first! From there, you'll convert fat to muscle with a sensible exercise (30 minutes three times a week) and eating (six meals a day!) plan that will give you your best physique and keep you at optimal health for life. This is a diet plan anyone can stick to: The portions are man-size, the instructions are simple, and the results will be food that even Archie Bunker would love! This program allows you to nourish your body and mind, wipe out cravings, create and maintain an incredible physique, and have increased energy for life! Science has found a straighter path to steady, successful weight loss, no starvation or death marches required! Without question, The Abs Diet is the ultimate plan for rapid and long-term weight loss. Each page will help you change your physique—and dramatically improve your life. The diet also includes an exercise program.